PLEASE NOTE THAT THESE TERMS AND CONDITIONS APPLY TO PURCHASES MADE ONLINE VIA THE WOOLTON PICTURE HOUSE WEBSITE OR TELEPHONE BOOKING LINE AND DO NOT APPLY TO PURCHASES MADE AT WOOLTON PICTURE HOUSE. The online and telephone purchase of tickets for any films showing at Woolton Picture House is subject to the following terms and conditions. By purchasing a Woolton Picture House ticket, you agree to be bound by these Ticket Terms. You also agree to use your ticket in accordance with these Ticket Terms and the Guest Admission Policy. Please read these Terms carefully before purchasing your tickets. 1.1 Cinema tickets may be purchased through the Woolton Picture House website listed in paragraph 8.1 below ("Site") or the Woolton Picture House telephone booking line ("Booking Line") using a credit or debt card approved by us. 1.2 By placing an order for tickets through the telephone Booking Line, you are making a request to book tickets for the relevant performance subject to these Terms & Conditions. Please note: this does not mean that your request has been accepted. 1.3 We will only be bound by an on-line booking through the website once we have processed your payment and we have sent an email confirming your booking has been successfully processed. 1.4 Ticket prices relate to the screening you wish to attend, not the day or time at which you purchase your ticket. Tickets are sold at the price displayed on the website for the relevant film and showing time. All prices and fees include any applicable value added tax. Please note that ticket prices vary and may be higher for special screenings. 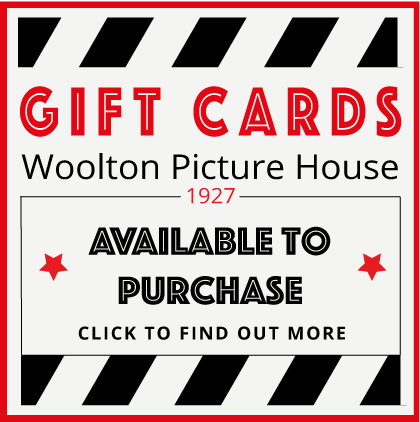 1.5 It is not possible to use any promotional vouchers or codes or Woolton Picture House gift cards when booking tickets through the website, unless stated otherwise on the voucher or code. 1.6 Tickets are subject to availability and are non-refundable. Woolton Picture House will not be held responsible in the event that you make any error when purchasing your tickets through the website: including but not limited to selecting the wrong film or the wrong number of tickets or if you are excluded from viewing the film (see paragraph 3 below). Please check that your selection is correct before confirming the booking as tickets cannot be exchanged or refunded at a later stage. Please Note: Lost, stolen or damaged tickets will not be replaced. 1.7 Seating is unallocated unless otherwise specified at the point of purchase. Where seating is allocated at the time of booking, Woolton Picture House will endeavour to ensure that you are provided with the seat that you have booked. However, Woolton Picture House cannot guarantee the seating allocation and shall reserve the right to make changes at our discretion. 1.8 All tickets purchased through the website or the Booking Line, will have a fee applied for booking your ticket(s), payable in addition to the ticket price. This will be clearly notified to you during the booking process. The total amount payable will be displayed as the headline ticket price inclusive of the booking fee. By sending a request to book tickets, you agree to pay the booking fee in addition to the ticket price. 2.1 Woolton Picture House will endeavour to ensure that advertised film schedules are accurate and that films are shown in accordance with such schedules. However, we cannot always guarantee the accuracy of the advertised schedules. We also reserve the right to cancel a showing, substitute an alternative film or vary the time of a showing, if necessary for any reason. 2.2.2 to issue replacement tickets for the same film at an alternative show time, but we shall not be liable to reimburse you for any expenses or any other losses incurred including but not limited to travelling costs and car parking costs. 3.1 Photographic identification for example; driving licence, passport or any other photographic identification that we deem to be acceptable or into 12A, 15A. 16 and 18 certificated films in the UK. Tickets purchased through the website or the Booking Line for such films can only be collected and/or used upon production of the necessary identification, if requested. 3.2.3 children under 12 years must be accompanied by an adult to watch any films starting at 7pm or later. 3.4 Other than as set out in paragraph 3.2 above, parent(s) and/or guardian(s) shall have sole discretion as to whether or not their children are accompanied. 3.5 Parents and guardians shall at all times remain responsible for their child(ren) whether or not they are accompanied. 3.6 Unless expressly stated otherwise, performances starting at or after 10.30pm are strictly for those aged 18 regardless of a film's certificate. Photographic identification may be required for entry into any films starting at or after this time. 3.7 For the purpose of the rules set out in this paragraph 3, an adult is a person aged 18 years or over. 4.1 Tickets can be collected at any till at Woolton Picture House. You will need to provide the debit or credit card that you used to purchase your tickets upon collection. 4.2 For tickets delivered to your mobile phone or computer as a barcode, please note that the person receiving the barcode is considered to be the rightful ticket holder and such barcode ticket can only be used once. 5.1 Photographic identification for any concession tickets including students purchased through the website or the Booking Line may be requested upon collection of the tickets and/or at the point of admission to the auditorium. 5.2 In the event that appropriate photographic identification cannot be produced upon request, you will be required to pay the difference between the concession price and the applicable full ticket price. 6.1 Nothing in these Terms & Conditions affects your rights under the law or excludes or limits our liability for fraud or for death or personal injury resulting from our negligence. In all other circumstances, our liability to you shall be limited to the price paid for your ticket. 7.1 Purchasing tickets through the website is safe. Woolton Picture House use the latest industry standard encryption technology to keep visitors' personal information safe. All ordering information including names and credit card details is encrypted using a "secure sockets layer" for maximum security. Credit card and billing information cannot be read as it travels to our booking system. 8.1 "website" means the Woolton Picture House Website: www.wooltonpicturehouse.com only. 8.7 Woolton Picture House reserve the right to amend these Ticket Terms & Conditions from time to time without notice. 8.8 Woolton Picture House may assign, transfer or deal in any other way with our rights and obligations under the Ticket Terms & Conditions to any party at any time without notice to you. You may not assign such rights and obligations. 8.9 If any part of these Ticket Terms & Conditions is unenforceable, invalid or illegal, the enforceability, validity or legality of any other part of the Terms will not be affected or impaired in any way. 8.10 The Ticket Terms & Conditions are governed by English law and you agree to submit to the non-exclusive jurisdiction of the courts of England and Wales.